At 47, Elena Abayan, felt there was no more chance to get a share and enjoy a bit of life’s little comforts. She works all day responding to neighbors’ calls for errands, from cooking to house cleaning and doing the dirty clothes in their laundry. She would get a measly P500by the end of the day, good enough to buy her family’s food and children’s school needs. This was Abayan’s routine, so toxic and exhausting who is unfortunate to have a lazy husband. But being the economist for her children, she neglected her weary flesh and thoughts bearing in mind the future of her children, whom she aspired to achieve a better life than hers. She continued the daily reeling for the precious day’s income. She also bore the suffering of sharing a small house with her husband’s family until super typhoon “Yolanda” struck with its storm surge gulping their house instantly. Fortunately, the rushing water inland and outland did not grab any of the kids from her sight until the flood subsided. They all survived. It was five years ago. Now, Elena opts to send those sad memories with the gushing of Yolanda waters toward the higher seas, and choose instead to thank the blessings she and her children have received from generous people and organizations. As she reflects, Yolanda was both good and bad. While the disaster wrecked many a people’s lives, it is the same calamity that gave her a “blessing in disguise”. 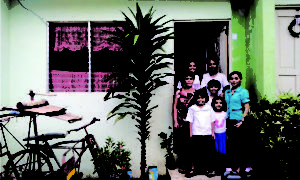 Being a beneficiary of the government’s housing program she now owns a unit she calls home to her family. It is located in a resettlement area to the north of the citywhere other victims of the disaster have likewise found their permanent place to live. The area is far from the noisy city streetsbut Abaya and the rest of her neighbors feel there is better security and opportunity to live a peaceful and more comfortable placethat is still surrounded with hills and abounding lush green forest, giving them a fresh morning breeze. “Even if we are new in our place, and even if my source of income is far from our place, for me, I consider our small community a peaceful and safe place to live in,” she said. “I know our place will ultimately become progressive because I am sure we will be taken cared of by the government under the leadership of President Rodrigo Duterte who is determined to help poor people like us,” Abaya added. She still continues to work for her family as her source of income, but she can now concentrate better on her job even as she leaves behind her children for work knowing they are in a better and secured home. The Yolanda survivorremains hopeful for a continued improvement of their lives with other victims, through government interventions. She believes and fully trusts in the integrity of government’s effort for the less privilege few. November 8 for her is not only a day to recall the catastrophe and sufferingsbut also a day to celebrate for the resilience of the people and above all, a day to thank the Almighty for the extension of life, a life more resilient and full of hope. ‘Though it is painful for me to remember the date because I also have relatives and friends who perished during the typhoon, we also have to accept the reality and be hopeful in order to have a peaceful and bright future,” Abaya said. ”The sad experience on Yolanda will never be forgottenbut we also have to appreciate the positive aspect it has brought to us. Let us bear in mind that the government is always ready to help us, most especially our God, the Almighty,” she added, reminding other disaster survivors who keep on whining and complaining of their situation despite being provided with assistance from the government. Abaya was among those who witnessed the activities of relative to the fifth Yolanda Commemorative Anniversary held last November 8 at the Tacloban City Astrodomewhere a series of activities were conducted such as wreath-laying in honor of the departed victims of the super typhoon, followed by a commemorative program and candle-lighting ceremony.